Shower rod lengths measuring less than 65"
If you would like to add a message along with your order, (e.g. : I would like overnight shipping. Please call me with the price.) you may do so below. This fabric shower curtain are made of the highest quality polyester material. The 100% polyester fabric is woven with 150 denier thread and a 64 x 56 count. All of the polyester fabrics have a waterproof Teflon finish but are soft and supple. The shower curtain liners are the quality used in fine hotels. All shower curtains are constructed with a reinforced triple folded header, 1⅜ inches wide, reinforced with a strip of no-tear buckram, and have metal rust proof grommets. Side hems are ½ inch wide, double folded. Bottom hems contain a chain weight, covered with a mildew resistant material, which is stitched into the bottom of the hem. The bottom hems are reversed to enhance the flowing off of soap and water. 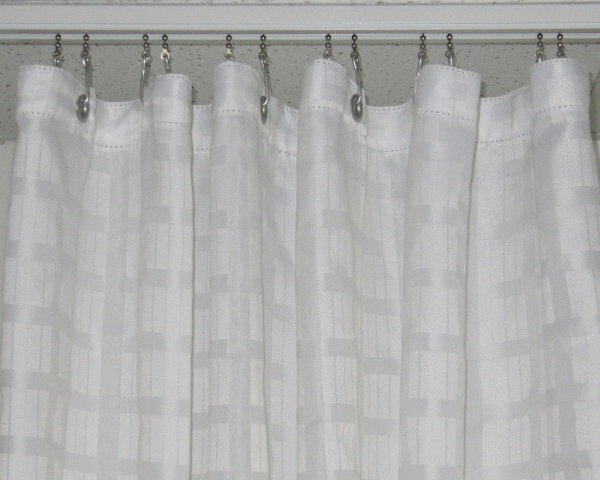 The Dynasty curtain has a white on white plaid pattern and is available only in white. When figuring what size shower curtain to buy figure on 10-30% over your shower rod length, this will give you ease while showering.